Synaesthesia – the unbidden association of certain differing senses – seems to be a fairly widespread phenomenon. If, as the old cliché has it, bulls are angered by the sight of a red rag, then, in unconsciously associating colour with emotion, all bulls are synaesthetes. And if music affects the mood of those who hear it, it follows that all who appreciate music are also synaesthetes; is not the “feel good” factor of Mozart or the sense of national pride inspired by Wagner a manifestation of synaesthesia? (And, to take it to extremes, is not my desire to strangle anyone who plays Chopin or Liszt with excessive emotion, indicative of synaesthesia within myself?) But, when it comes to music, we tend to reserve the label Synaesthesia to those who inadvertently associate certain tonalities with certain colours. 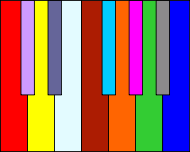 Rimsky-Korsakov, who clearly had a mild form of the condition, suggested that all Russian musicians experienced synaesthesia, and without doubt the most famous musical synaesthetics was Skryabin for whom various keys created such strong colours in his mind that he devised the colour keyboard (see above) which bathed the hall in the appropriate light during a musical performance. At university we did a performance of Prometheus with the colour keyboard, and very thought-provoking it was too - unlike the simply hideous attempt by the American pianist Evan Shinners to convey his synaesthesia in a video of the colours he feels while playing, with extraordinary ineptitude, a piece of Bach - http://www.youtube.com/watch?v=u9PxsEFSlqU&feature=player_embedded. For me this is both distracting and confusing, seeming more like a student disco than a serious musical illustration. A discussion after the Skryabin performance revealed a number of my fellow students also experienced synaesthesia to a greater or lesser extent, usually inadvertently associating colours (or, in one case, a strong taste) with certain keys. For my part I had no sense of colour/key linkage then, but, whether as a result of thought stimulation or growing aural experience, I find I have developed it very mildly indeed since. I don’t feel or experience any colour sensation when I hear or play music, but as I read scores in certain keys, very specific colours impinge on to my consciousness. D minor, for example, is purple (the ecclesiastical colour for Lent and Epiphany), E flat (my favourite key), a rich golden yellow not unlike the tablecloths in expensive Chinese restaurants or the colour used to paint the doors and window frames in the houses belonging to the Cowdray Estate in Sussex. D major is red and F major a very fresh green. But some keys have no colour association whatsoever. When I read through the score of Bach’s Toccata (BWV540), I sense green throughout the F major bit, but when it lurches into C major, any sense of colour disappears totally from my mind. Beyond synaesthesia, colour and music do have some linkage, subconsciously or otherwise, and many of the problems which have befallen Dewan Filharmonik PETRONAS can be dated to the time when the faded green of the original upholstery was replaced by a faded maroon. Coincidence? Perhaps, but I have my doubts. Certainly many have claimed that the dusty, sandy shade used for carpets and upholstery in London’s Royal Festival Hall created an unwelcoming ambience, while when the Royal Albert Hall went for rich maroons and dark reds, it suddenly seemed a much more rewarding place in which to hear music. Musicians’ black and white is considered important, since other colours would detract from the performance, and it is interesting to note that when certain female violinists and singers appear on stage in lavish gowns, critics will often comment on the colour before the music; a sure sign that the colour is a distraction – and many choose to dress this way deliberately for that reason. When it comes to musical instruments, there is no real reason why they should not now be cast in a whole range of vivid colours, but, matters of uniformity aside, there are important reasons why musical instruments need to retain their brown or black hues, and that goes back to synaesthesia. If music creates colours in the minds of listeners, then the sources of the music need to be as neutral as possible. So the very deliberate choice of an orange piano by a German cabaret pianist, Stefan Aaron, is clearly sending some kind of a message. 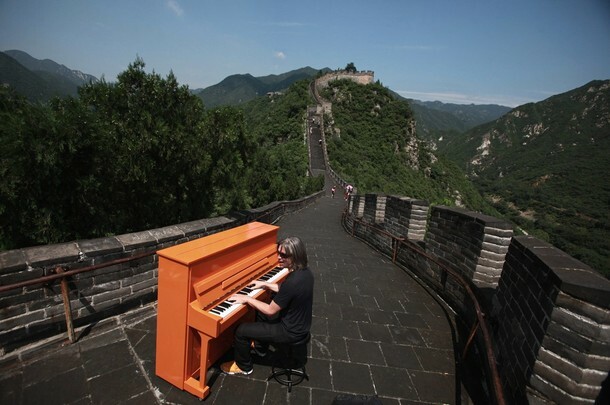 For those unaware of the fact, Aaron was yesterday playing his piano on the Great Wall of China. 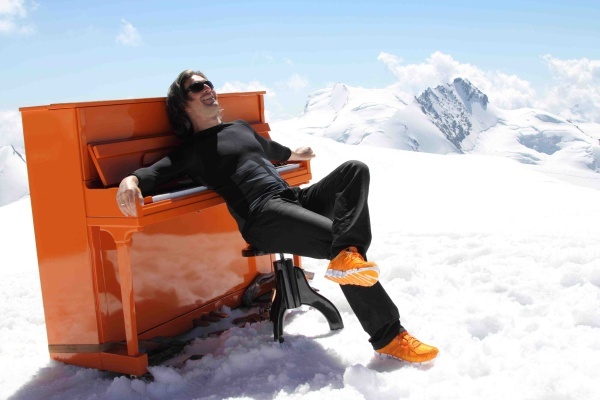 He has made something of a specialism of playing his piano in weird and wonderful places, and has earned a place in the Guinness Book of Records for the highest piano performance when he played, in August 2011, on the peak of a Swiss mountain at an elevation of 4206 meters. So why does he choose an orange piano? Parsons in Hong Kong currently has both a totally transparent piano and a “Ferrari” piano – a grand piano shaped like a Ferrari and coloured dazzling scarlet. I’m quite sure that if Aaron was out to create a purely visual spectacle, these would have done him much better than the humble orange upright depicted below. Similarly, a white piano to blend in with the Swiss snow or a grey one to match the Great Wall, would have made sense. But no, he is insistent that the piano he chooses for these ventures into stratospherically improbable venues is orange, and the clue comes from his own comment when asked why he does it; "I want to put my orange piano, whose colour fits the positive energy of my songs, in unusual places and see what happens". He creates a new piece to suit the location, but sees the orange of the piano as an essential means of communicating “positive energy”. Is this a further manifestation of synaesthesia? Certainly Aaron’s choice of orange fits in with what Psychology Today suggests are the subliminal messages sent out by the colour; “Orange calls to mind feelings of excitement, enthusiasm, and warmth. Orange is often used to draw attention, such as in traffic signs and advertising”. But how do other musicians see orange? Scriabin associated orange with G major (see below), a key which many also associate with strength and conviction (the British national anthem, for example, is always played in G major). However, in 1806 Christian Schubart published a list of keys and their associated qualities as revealed by (as he saw it) the use of those keys by classical composers. In his list, G major was associated with “Everything rustic, idyllic and lyrical, every calm and satisfied passion, every tender gratitude for true friendship and faithful love. In a word every gentle and peaceful emotion of the heart is correctly expressed by this key”. Sir Isaac Newton saw in the colours of the spectrum an equivalent with musical intervals; in which orange represented the interval of a minor 3rd. But for another of music’s synaesthetes, American composer Amy Beach, orange had no musical associations whatsoever (for her the key of G major was bright red). It would be interesting to know whether Aaron was playing his “song” in G major to reinforce the orangeness of the piano, thereby associating himself with the Skryabin’s view, or with a prominence of minor 3rds, thereby following the Newton theory. My guess, however, is that he had read this on www.empower-yourself-with-color-psychology.com ; “The colour orange relates to social communication, stimulating two way conversations. A warm and inviting colour, it is both physically and mentally stimulating, so it gets people thinking and talking!” As, indeed, should all music, wherever it is performed and on whatever coloured instrument.